The heart of Us makes itself known before any blood spills. 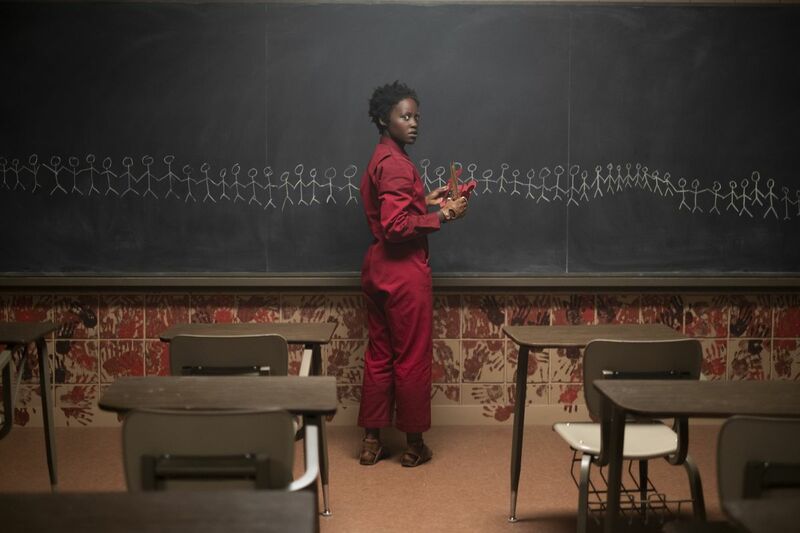 Right after Red, the gasping doppelgänger of Lupita Nyong’o’s character Adelaide Wilson, marches her lookalike family into the Wilson family lake home, she sits down opposite her mirror image and identifies herself. The raspy declaration explodes Us into a Rorschach test of social despair, with a handful of twists ensuring the audience is on its toes until the very last seconds. Us is a film about the mass population, about those left behind, about those who leave those left behind, about technological advancement, about religious fundamentalism, about relationships we sell ourselves, and about the misplaced pride we find in everyday life. Or maybe it’s not. The movie is full of possibilities, but one line delivered in Red’s raspy voice, a thesis statement of everything to come, gives us the 30,000-foot view of the message. Peele made that even clearer when speaking before the premiere of the film at the 2019 SXSW festival. Landing in a circle of confusion is the way writer-director Jordan Peele wanted it — and why he tells Polygon that he’d be open to returning in the future, in some undefined capacity, to the world of Us. In terms of reveals, Us swerves left, swerves right, then barrel rolls from side to side before launching itself off a cliff Thelma-and-Louise-style. The reveal that Red and the other Wilson lookalikes are not alone, but foot soldiers in a militia of revolting doppelgängers, is a gut punch. (The minute Us reveals Tim Heidecker #2 is up there with the oh-these-zombies-can-run moments in 28 Days Later — no one is safe.) Then we learn that there’s nothing magical about the tethered; like Get Out, there’s a pseudoscience basis for the horror scenario, involving secret clone experiments conducted in the abandoned tunnels underneath the United States. And it’s not just that there’s a double of every single American — they’re all synced to our movements. Or, that was the plan. The real doozy of a twist is when Jason, Adelaide’s son, realizes that maybe his mother is “the evil twin.” We don’t have to rely on any diabolical grin (although we get one of those, too, for good measure): Peele flashes back to the first scene in the film, as a young Adelaide comes face to face with her double in a carnival house of mirrors, to extend the moment, when the tethered clone from the tunnels below actually swaps places with the “real” Adelaide. The clone has been living as one of us (hey, that’s the name of the movie!) the entire time, and at least in the final moments of the film, she’s getting away with her break out. Us leaves the audience with a handful burning questions. Is there an end goal to the tethered invasion or was the faux-Hands Across America pose an ironic victory lap for a people who simply needed to disrupt the status quo? Where will the Wilsons go now that the country has been upended? Who was behind the cloning project, and what’s going to happen to all of those bunnies? Obscure and metaphysical explanation to cover a phenomena. Reasons dredged out of the shadows to explain away that which cannot be explained. Call it “parallel planes” or just “insanity.” Whatever it is, you will find it in the Twilight Zone. Us owes the audience nothing more, but according to Peele, there are plenty of answers — you just have to be Jordan Peele to know them for sure. But would he ever return to the “Us-verse” to tell another story? For anyone who treasures Us’ ambiguity, the idea of carving out more of the who, what, where, when, and why of Red’s backstory may send a different kind of chill down the spine. But lest we forget the great horror sequels built on foundations of other terror that didn’t need to be explained: George Romero’s Dawn of the Dead, John Carpenter’s Halloween II, Juan Carlos Fresnadillo’s 28 Weeks Later, Chuck Russell’s ecstatic A Nightmare on Elm Street 3: Dream Warriors, and James Cameron’s genre-shifting Aliens. There may be places to go with Us that we couldn’t possibly imagine — which sounds like the perfect job for Jordan Peele.